9 December 2016 - 19 February 2017. Manly Art Gallery & Museum. Seagrass meadows grow along coasts around the world, and new scientific research reveals how seagrass contributes significantly to sustaining life as we know it. Per square metre, seagrass sequesters (locks away) significantly more c02 from the atmosphere than all vegetation on land. William Gladstone imagines a lens for listening as well as for seeing beyond the limits of human perception. In collaboration with Lisa Robertshe creates the installation, Oceanic Bliss, to share what we know and feel, as scientists and as artists, about our surprisingly vital relationship to seagrass. The Seagrass Lens becomes the centre piece for Oceanic Bliss, and a prototype for their forthcoming research into "What happens under sea ice at full moon?" 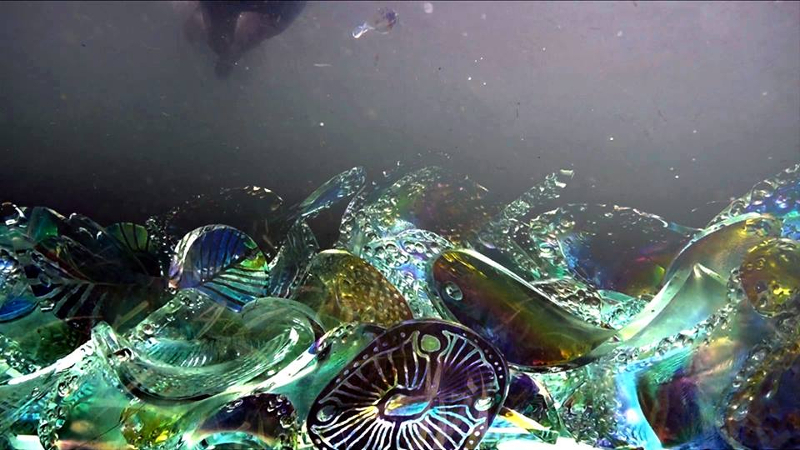 Oceanic Bliss is one of nine installations for the Ku-ring-gai Ph Art + Science Projectinitiated by Eramboo Artist Environment and curated by Susan Milne and Katherine Roberts. Click herefor information about all the collaborating scientists and artists. Ku-ring-gai Ph Art + Science. Look, touch, draw or write. Benches come from labs and studios where we visualise the diversity of life forms that co-evolve to create seagrass meadows. We experiment with ways to describe the forms as parts of a natural system comprising parts that range in scale from the astronomic sun, moon and earth, to the microscopic phytoplankton (tiny aquatic plants) that absorb life-giving light photons. Objects on the benches reflect a mix of new and traditional materials used by us and fellow researchers Dr Anne Colville, Susan Fenech and Dr Jim Franklin. As an example, we use fibre optic and cotton threads to represent phytoplankton that photosynthesise (convert sunlight to sugars) to grow and in turn become food for fishes. Journals are maintained to document our collaborative process of expanding our understanding and responses through science and art, by sharing ways we see, touch, draw and write. Our conversations evolve through the largely unambiguous language of science and the diverse poetic languages of the arts. We invite your comments on our work and your responses to our question, "What do we know about seagrass?" Seagrass meadows occur in the shallow waters of the shores of Ku-ring-gai Chase National Park, where three species can be found: Posidonia, Zostera, and Halophila. Science aims to understand nature and the rules that govern it. Ideas are tested through observations and experiments in a journey of creativity and discovery. Understanding unfurls, providing moments of new scientific insight that are as emotional as personal experiences of works of art. Sunlight powers the transformation, in the leaves of seagrass, of carbon dioxide and water to carbohydrates (used by the seagrass for food) and oxygen. Carbon becomes part of the leaves, roots, and rhizomes of living seagrass, and eventually the underlying soil when the seagrass dies and decomposes. The rate of carbon dioxide capture and storage by seagrasses far exceeds terrestrial forests. Seagrass provides habitat for fishes, octopus and cuttlefish. Many species valued by humans depend on seagrass for a nursery in their young, juvenile life stages. Plankton emerge from the seagrass canopy under moonlight. We connect to seagrass through our history, stories, food, play, and the experience of wilderness it provides. We protect what we care for. I invite you into my surprising experience of seagrass. An oceanic world is shown as both a timeless dreaming and a present day reality, reflecting my growing sense and knowledge, of relationships between oceanic and terrestrial life. I swim in seagrass meadows with scientist William Gladstone (Bill). He shows me curious lifeforms and explains their interdependence. I sense with my body an ancient choreography and come to see in the seagrass the tendril forms in an angiogram of my heart! This surprising sense of relationship inspires me to dance, draw and animate ancestral forms that I recognise in the water, and in nearby rock engravings. I dance in the UTS Data Arena and Bill and new media artist Jason Benedek co-direct the motion capture. And so we share our similar and different experience and knowledge of seagrass. More connections grow as I project the motion captured data over canvas and hand-trace the gestures frame by frame: I add the motion captured dots and lines of an ancient Chinese calligraphic form for Ocean, earlier performed by language specialist Vikki Quill. Now, painting with white between transparent coloured glazes, I see the dots and lines as particles and waves of light dispersed in water. I come to think of photosynthesis as lifeâ€™s great connecting energy. What colours do plants and other animals 'see'? What happens in the seagrass at full moon? What does photosynthesis look like? Shine a light to animate a seagrass bed. Imagine yourself swimming through diverse life forms. Find similarities in shapes of the plants and animals, like the slender leaves of Zostera capricorni (Eelgrass), the bodies of Stigmatopora nigra (Widebody Pipefish) and our own human forms. Imagine yourself as one of many forms co-evolving to sustain life. We create this work in conversation with each other and with other people, about the similar and different ways we experience and understand, as scientists and as artists. Fluorescent acrylic pieces come from the labs of optics physicist Dr Jim Franklin, at the University of Technology Sydney. Jim used different coloured pieces to test ways that light can be transmitted for optimal photosynthesis in algae. His tests led to further experiments that in turn led to algal biofuel production as a sustainable alternative to fossil fuel. Exhibition/Art+Science Labs: 9 December 2016 - 19 February 2017 at the Manly Art Gallery Museum, West Esplanade Reserve, Manly. Art+Science: a melding of methodology, passion and creativity. Ocean Bliss Research in progress, in the field and in labs and studios. Photo by William Gladstone. A unique project that began as an opportunity for artists and scientists to work together is already surpassing expectations according to UTS Science participants Professor William Gladstone and Dr Lisa Roberts. The project, Ku-ring-gai pH: Art + Science, pairs artists and scientists to collaborate creatively to develop new artworks responding to the natural environment, cultural heritage and scientific values of Ku-ring-gai Chase National Park (KCNP). The artworks will be accessible to the public in an exhibition at Manly Art Gallery Museum from December 2016. Gladstone, a marine biologist with a passion for photography, and Roberts a visual artist, and Visiting Fellow in UTS Science, share a love of the beauty of the natural world and are dedicated to its conservation. Both were keen to experience how their different training, and interactions during the collaboration, would impact on their responses to the same KCNP environment. The outcomes are taking the pair on a surprising journey. "We have just completed our first work for the exhibition and already it's been selected for installation at the prestigious Sur Polar (Antarctic Arts) Video Exhibition at Complutense University of Madrid," Gladstone, Head of the School of Life Sciences says. The video "Oceanic Bliss" celebrates the diversity in life and our connectedness to the ocean. Roberts, who also leads the Living Data program believes that this is a perfect demonstration of how scientists who are also artists can "expand the reach of their knowledge in novel, innovative and unexpected ways." Closer to home they have been invited to participate in the Vivid Ideas program hosted by The Museum of Applied Arts and Sciences. The ArtScience Soiree: Collaboration across Disciplines will celebrate the passion, methodology and creativity shared by the two disciplines with the aim of facilitating new relationships between them. With just over six months until the Manly Art Gallery exhibition and with busy, diverse professional lives, Gladstone and Roberts are appreciative of the opportunity to explore both the creative process and the time and space to better understand the differing aspects of their natures. Further details: Ku-ring-gai pH: Art + Science - A wide range of areas of scientific study will be represented in the project and the outcomes with collaborating artists will include installation, film, drawing, painting, sound and sculpture. Exhibition: 9 December 2016 - 19 February 2017 at the Manly Art Gallery Museum, West Esplanade Reserve, Manly. Sur Polar (Antarctic Arts) Video Exhibition - Sur Polar has come to Madrid to take part in the activities of the Antarctic Week organized by the Complutense University. 10 - 20 May 2016. ArtScience Soiree: Collaboration across Disciplines - As part of Vivid Ideas, the Museum of Applied Arts and Sciences (MAAS) will be hosting the ArtScience Soiree - a free networking event for practicing artists and scientists interested in cross-disciplinary collaboration. Exhibition: 9 June 2016 - 19 Feb 2017, Tues - Sat 10am - 5pm. New collaborations for Living Data contributors are facilitated through the innovative Ku-ring-gai Ph art-science projectled by artist/curator Susan Milne and curator Katherine Roberts. Ten scientists and ten artists are brought together to inspire care and understanding of Australia's iconic Ku-ring-gai National Park. Click herefor information about all the collaborating scientists and artists.